Warwickshire captain Jim Troughton is still "upbeat" over the Bears' County Championship title hopes despite the frustration of failing to beat Surrey. Needing 10 wickets on the final day, Troughton's men managed just three. Although Nottinghamshire also failed to win, their rivals claimed an extra bonus point to edge back on top but the Bears crucially have a game in hand. "We're upbeat. 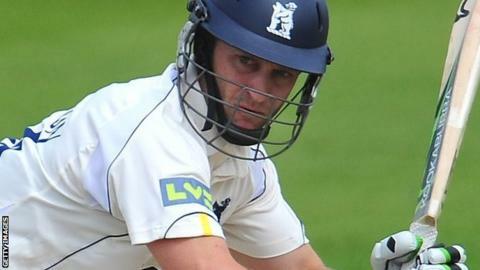 It's neck and neck but we're a happy camp," said Troughton ahead of Wednesday's Middlesex game. "We're playing a brand of cricket we're very proud of and everyone's in a good place. "We're not watching too much what's going on at Notts. "We did feel like as if we'd failed with an opportunity to get a stretch on them. "It was a good wicket and Surrey batted very well but I still felt as if we created enough chances to give us a sniff. "We had a few half chances which did not quite go to hand, when some days they stick. And we didn't have any help from the weather interruptions. "But we do have this game in hand and we're playing good cricket." The Bears' game in hand, this week's four-day clash with Middlesex, is at Uxbridge, on a ground where the Bears won by an innings the last time they played there in 2008. "That's a good omen," said Troughton. And, although stand-in Richard Johnson, recalled from his loan with Derbyshire, batted well on his first team call-up against Surrey, making 49, it appears that first-choice wicketkeeper Tim Ambrose is fit to return. "He's declared himself fit, so I think he'll be coming back in," added Troughton, who was also pleased with the promise of fit-again paceman Boyd Rankin on his first Championship start of the summer. "Boyd ruffled a few people," said Troughton. "When he's in the team he sends shockwaves through the middle to late order of any team."